Corinne Meharg: Quiltodontist | Smile! 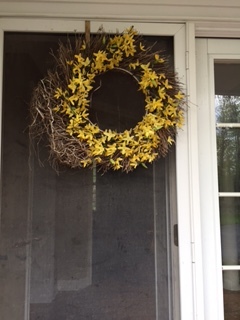 I’ve been watching a pair of robins build their nest in the forsythia (fake) wreath on my front door. 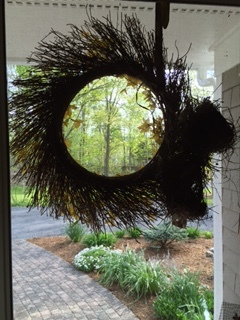 They did a great job with twigs, grass and mud, but it was a little too heavy and slid to the side of the wreath holder. Oops, the eggs fell out. 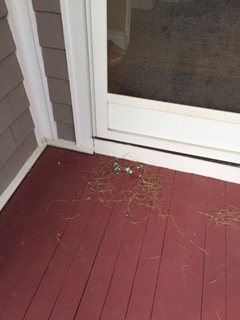 They built a second nest above the first and the same thing happened, slid to the side and oops, another clutch of eggs hit the floor of the porch. I felt bad for them and this morning, I noticed a pair of robins building in a tree close to the house. I hope that it’s the pair from the porch who made the necessary adjustments to their housing arrangements. Sometimes, you just need to rethink things. Yesterday was a perfectly beautiful day! I spent several hours hauling year old mulch around my yard, whacking weeds with my scuffle hoe and admiring my handiwork. Today is another story. Cold. Wet. Gray (or is that grey?). 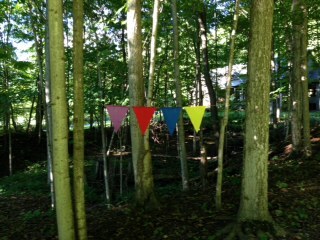 So I’m heading to my studio to make some yard flags to cheer me up. I’ll show you a picture when they’re done. Got a few cut out, stitched up, the day improved and the sun is out!!! Even took a picture, (and video, but that might be more than I can handle getting on here). You almost can’t see me. anyway. 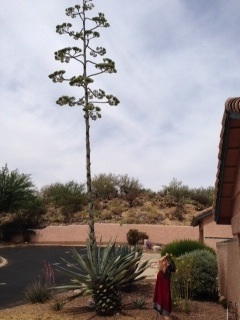 The name century plant is overly optimistic. 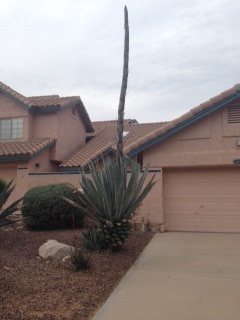 A return visit in May was surprising, it was close to 30 feet tall. We admired it for a week and then started to wonder what would happen when it fell over. 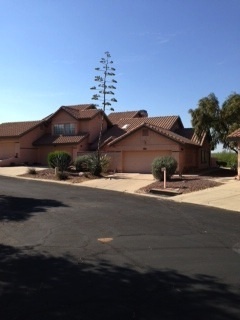 The leaves were starting to wither and brown, but this is the desert. We asked the gardener who was working on the common areas around our house to take a look. 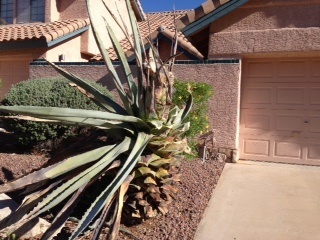 He said, “That is very dangerous.” One chainsaw later and goodbye stalk! It was very heavy, probably several hundred pounds, so it was a good thing we whacked it before it whacked us or the car. Now, it is just ugly. I’ve been thinking about time lately. I complain about my lack of it, how quickly it goes, how I’m spending it, how we waste it. Before I went to the Uplevel Your Business Gold Retreat in Asheville, I had committed to writing another blog post and I did try to do it the night before the event started, in my hotel room. I couldn’t remember how to do it because I had not spent enough time practicing and couldn’t figure out the link. 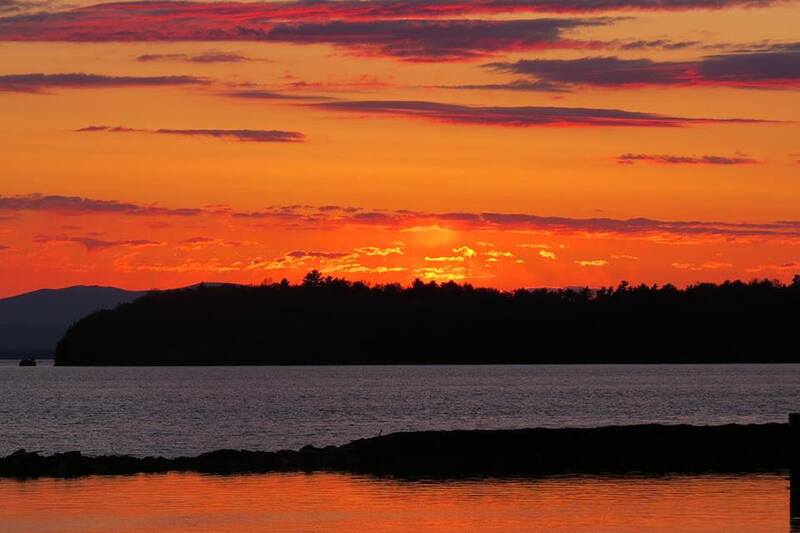 So I think the point of this post is that I am making a new commitment to really pay attention to time and use it in the way that best feeds my soul. This was erin’s studio and this is her story. However, it’s mine now and there will be a story from me………..eventually. I’m starting to believe it’s coming. It is March 28th, not April Fools Day! We have been giving out wonderful bent pens for years at Franklin Square Orthodontics, aka FSO and I always do my spiel where I say, “it’s a bent pen, but we could straighten it out, we’re an orthodontic practice.” Several of our patients mentioned that we should give out straight ones at the end and I did eventually remember to order some. 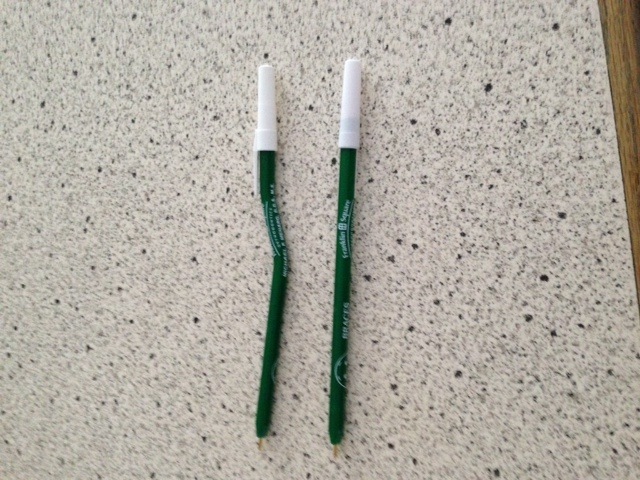 So I had to smile when I noticed that I had 2 pens on the kitchen counter, one straight and one bent. I find the bent one much more interesting as a conversation starter!